It’s not like I didn’t know how terrible slavery was (is?). I’ve read fiction and non-fiction, saw movies and documentaries. It was a hot topic in the Brazilian soap-operas I watched while growing up. But Kindred felt more real than most other stories about that period, and for that I blame the way it blurs the borders between right and wrong and focuses on that darn human complexity. People survive, people adapt and it’s not always easy to see slave owners and anything but evil and slaves as anything but victims. 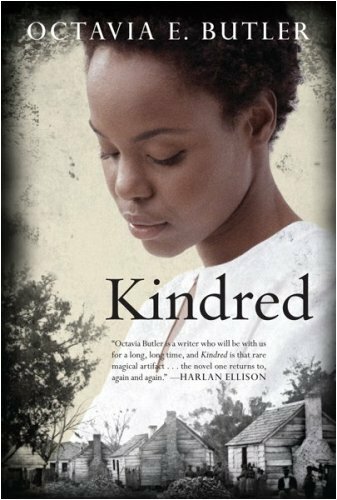 With Kindred, Octavia Butler created the perfect setting to illustrate these nuances: Dana is a young black woman in 1976 who has both slave and white ancestry. She just bought a house with her (white) husband. For reasons never explained, she shares a special connection with her white, slave-owning ancestor, Rufus. This tie forces her to travel back in time to help him when his life is endangered. She doesn’t know when (or if) she’ll come back, so she makes the best to fit in and survive. More shades of grey: when she’s beaten up, Dana doesn’t blame the slaves who do not interfere (would I in their place?). Rufus is raised by a tyrant father who has an unbreakable code of honor that eventually works in Dana’s favor. Rufus has been raised and cared for by slaves, whom he cares for as well, until he begins to see them as property and violently demanding their love. After all, Rufus would not be judged by his peers for sleeping with slaves, but loving them is another matter. Rufus’ mother abuses young female slaves, but she often sees them pregnant by her husband (what would I do in her situation?). So Dana, in her decreasingly detached clarity, starts to realize that there’s more to slavery, and people’s attitudes towards it, than what’s in the history books. And I’m sure we can apply this to lots of other things: prostitution, terrorism, genocide. An author’s capacity to make a reader acknowledge humanity’s true complexity, even at the cost of comfort, is a real gift. I just finished this a couple days ago! Your review is wonderful. I agree that it was an amazing look at slavery. You think you know exactly what it is, but this book gave such an intimate look at it. The shades of gray in who Dana felt like blaming was one of the most interesting aspects. I can’t remember which Octavia Butler book I read years ago, but I always thought she was an extremely talented writer. I need to pick up this book and read more of her work. So glad you liked it! Butler is one of the authors I REALLY want to read more of. I couldn’t agree more with your final sentence. So glad you liked this too! Excellent review. I’m always happy to see Octavia Butler getting attention. I think she’s terrific and I wish more people would read her. I think my take-away from this book is slightly different from yours. While I agree with your comments, I think part of the books power lies in the way it shows how pervasive the evil of slavery was. It’s not that Dana comes to see shades of grey in people’s behavior, but that slavery, over so much time so many generations, has corrupted everyone it touched, even the slaves themselves. For me, Kindred made it impossible to defend the institution of slavery at all even while it complicates the morality of those involved in it. It’s also a wonderful read, one I could not put down. I’m really interested in reading this, it sounds really interesting. I love when authors can make you see both sides and really feel for the characters and wonder what you’d even do in such a situation. So much harder to do, I’m sure, than painting them as good or evil. I really enjoyed this book and I think you captured it well! @Natalie: I was surprised I hadn’t even hear of her until this year. I’ll look up her other books as well. @Joanna: Thanks ever so much for the tip! @Nymeth: Do you have a review fo this book as well? Tried to look, but no luck. @cbjamess: I like your views and don’t think they are mutually exclusive with mine. I actually thought of her arm as a symbol of slavery’s impact in Dana’s life, even after the happy ending. And we also see from her husband’s reaction when he come back for the last time that things won’t be the same for him either. @amymckie: It’s a gift, isn’t it. It’s so easy and comfortable to paint a clear line between good and evil, both for authors and reads. it take guts to do something more realistic. The book was written in the 70s and I can well imagine that Butler had to answer for her decision to portray Rufus as still lovable and worthy of redemption. @Kailana: Thanks 🙂 Do you have a review I can add in “other thoughts”? Kindred is one of the most raw and harrowing accounts of slavery. And we are profoundly affected by its legacy. This Butler makes quite clear in the devices that she chooses to tell the story. One of her best works. Thanks for the review. I’m sold on your description that this book felt more real than other slave fiction you’ve read. It does sound very wonderful and the premise of going back in time and experiencing something like slavery is intriguing. Oh, I loved this book! I read it this year, too, and was really blown away by it. Like you, I understood how bad slavery was before reading it, but after reading it, I understood how bad it was on a very personal, individual level that made it much more immediate. A very important lesson. @Kinna: Yes, I think one of the main messages of the book is that slavery (as with other terrible things like genocide or the holocaust) have a lasting impression. @Aths: Please try it out, it’s worth it! @Larissa: you won’t regret it! @Aarti: I’ve added your review to the list above, thanks for flagging!